Patients with chronic kidney disease (CKD) need to follow phosphorus-restricted diets because impaired phosphorus excretion induces hyperphosphatemia in CKD, which increases mineral and bone disorders, cardiovascular diseases, and mortality; however, hypophosphatemic osteomalacia caused by phosphorus-restricted diets in CKD patients has not been described. We report here a patient with CKD in whom hypophosphatemia resulted in osteomalacia because of a phosphorus deficiency from a strict phosphorus-restricted diet. The patient with CKD stage G3b, estimated glomerular filtration rate, 31.5 presented with bone pain, muscle weakness, and multiple fragility fractures. She had been diagnosed with severe osteoporosis and treated with risedronate sodium and 1α-hydroxyvitamin D3 (alfacalcidol). Laboratory tests showed hypophosphatemia (1.7 mg/dL) with aphosphaturia; serum fibroblast growth factor 23 (FGF23) was <3 pg/mL. Radiological studies showed multiple fractures, and bone histology and morphometry of the iliac crest demonstrated a large amount of osteoid, with marked increases in all osteoid-associated parameters. Despite continuous administration of alfacalcidol, hypophosphatemic osteomalacia did not improve. The patient maintained a strict phosphorus-restricted diet, and laboratory examination indicated osteomalacia accompanied by phosphorus deficiency. Phosphorus supplementation improved her symptoms and pathological fractures in parallel with improved bone metabolic markers. Additionally, bone mineral density of the lumbar spine increased, suggesting calcification of unmineralized bone tissue. We conclude that this is a unique case of hypophosphatemic osteomalacia induced by a strict phosphorus-restricted diet and subsequent phosphorus deficiency in a patient with CKD. Histomorphometry revealed a marked increase in osteoid and phosphorus supplementation improved symptoms, fractures, and bone metabolic markers. Hypophosphatemia causes impaired bone mineralization, resulting in rickets and osteomalacia, which decrease bone density and increase bone fragility. Patients with hypophosphatemic rickets/osteomalacia present with bone pain and muscle weakness occasionally complicating pathological fractures. The biochemical characteristic is elevation of serum alkaline phosphatase. Vitamin D deficiency and intestinal malabsorption are the most common causes, whereas increased renal tubular phosphate loss, including excess circulating fibroblast growth factor 23 (FGF23) and renal tubular disorders also result in development of hypophosphatemic rickets/osteomalacia. Phosphorus restriction is an important nutritional treatment of mineral and bone disorders in chronic kidney disease (CKD-MBD). Elevation of serum phosphorus is associated with increased mortality in CKD-MBD. Phosphorus retention occurs as a result of intestinal absorption exceeding renal excretion and/or dialysis removal. Dietary control of phosphorus load is helpful to preventing development of CKD-MBD, but dietary restriction is difficult because of the high phosphorus content in diets in developed countries today. Thus, hypophosphatemic osteomalacia patients resulting from dietary restriction has not been described in CKD. We report here a patient with CKD in whom hypophosphatemia resulted in osteomalacia because of phosphorus deficiency caused by a strict phosphorus-restricted diet. A 71-year-old Japanese woman with CKD developed bone pain, muscle weakness, and multiple fragility fractures of the hip, vertebrae, ulna, and tibia upon falling or after a slight collision. She became unable to walk or stand up by herself. She had been diagnosed with severe osteoporosis and treated with risedronate sodium (17.5 mg/wk) and 1α-hydroxyvitamin D3 (alfacalcidol) (0.5 µg/d) for at least 1 year; however, she had repeated fractures of various bones, regardless of these medications. She had no history of exposure to heavy metals, abdominal surgery, or treatment with phosphate binders, anticonvulsants, or antacids such as aluminum hydroxide. She had also no abnormal development or bone deformities in her childhood and adolescence, or bone metabolic diseases, such as congenital rachitic disorders, in her family history. The patient had been diagnosed with CKD of unknown cause 2 years ago, and had maintained a strict phosphorus-restricted diet composed of calcium (310 mg/d), phosphorus (600 mg/d), and vitamin D (160 IU/d). She washed and boiled all ingredients thoroughly and completely avoided high-phosphorus foods and those containing inorganic phosphorus as an additive. Laboratory tests showed normocalcemia (8.8 mg/dL; reference range, 7.0-10.0 mg/dL), hypophosphatemia (1.7 mg/dL; reference range, 2.9-4.3 mg/dL), and aphosphaturia (0 mg/d; reference range, 340-1000 mg/d). Furthermore, the 25-vitamin D concentration was 9 ng/mL (reference range, 25 to 80 ng/mL) and FGF23 was <3 pg/mL (reference range, 8-54 pg/mL). 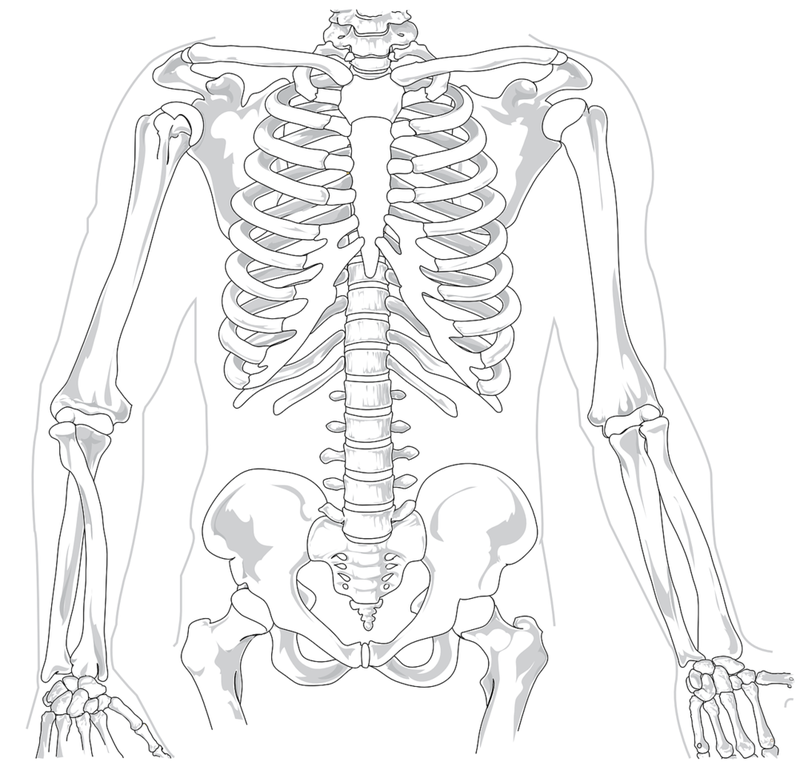 Radiological studies revealed multiple fractures in the spine, ulna, tibia, and femur. Bone mineral density (BMD) of the lumbar spine (L2-L4) measured using dual energy X-ray absorptiometry was at the level of osteoporosis (T score, −2.5). Bone scintigraphy showed multiple hot spots, especially in the extremities and ribs. The patient’s medical history and laboratory data suggested osteomalacia caused by phosphorus deficiency. To confirm this diagnosis, a transiliac bone biopsy was performed after double tetracycline labeling; the bone specimen was then methylmethacrylate-embedded using a nondecalcifying process. Bone histology and morphometry of the iliac crest demonstrated a large amount of osteoid, with marked increases in all osteoid-associated parameters, including osteoid volume, osteoid surface, and osteoid thickness. Various manifestations of mineralization defects, such as a few double, lamellar, thin, and thick single labels of tetracycline, were observed fluoroscopically. Osteomalacia was diagnosed based on these specific bone tissue findings. Alfacalcidol was retained for treatment of vitamin D deficiency and risedronate was stopped. Furthermore, to treat phosphorus deficiency, administration of a neutral phosphorus mixture (elemental phosphorus, 2.0 g/day) was started after bone biopsy. After 2 weeks of phosphorus therapy, serum phosphate rose rapidly to 4.5 mg/dL and the phosphorus dose was reduced to 1.0 g/d. Muscle weakness and bone pain resolved and the patient was able to sit up on the bed by herself. Consistent with the healing of osteomalacia, serum bone alkaline phosphatase gradually reached the normal range and serum FGF23 rose to 12.7 and 24.8 pg/mL at 1 and 6 months after phosphorus supplementation, respectively. Radiographs of the right femur showed pseudofracture on admission, with undisplaced radiolucent lines perpendicular to the femoral cortex, and healing of the pseudofracture 10 months after phosphorus treatment. Multiple hot spots in bone scintigraphy also became light; moreover, BMD of the lumbar spine increased to the lower limit of the normal range (T score, −0.9). After treatment, the patient was able to walk with a cane. Phosphorus is important for growth plate maturation and skeletal mineralization, and rickets/osteomalacia accompanied by hypophosphatemia presents with skeletal abnormalities. Hypophosphatemia results from excessive phosphorus loss (reduction of phosphorus reabsorption in the kidney or/and absorption in the gut) and insufficient phosphorus intake. Almost all hypophosphatemic rickets/osteomalacia, such as FGF23-related hypophosphatemic rickets/osteomalacia, Fanconi syndrome, vitamin D deficiency, and dependency, present with excessive phosphorus loss from the kidney and/or the gut. Osteomalacia induced by depletion of phosphorus is easily produced in experimental animals; however, this cause is very rare in humans. Phosphorus is ingested both as a natural component of food and as an additive. On average, about 60% of dietary phosphorus from natural food on average is absorbed in the intestine as inorganic phosphorus, whereas phosphorus originating from plants is absorbed less efficiently (<40%). Conversely, phosphorus salts added as food preservatives are almost completely absorbed (approaching 100%). Currently, the quantity of phosphorus ingested from food is always sufficient because various phosphate salts are widely used as food additives. Excessive ingestion of phosphorus is regarded as an important problem in patients with CKD. These patients tend to be positive in phosphorus balance because of impaired renal excretion, and thus are at increased risk for CKD-MBD, hospitalization, and cardiovascular mortality. Therefore, dietary restriction of phosphorus is crucial in nutritional treatment of CKD-MBD. In our patient, the presumed absorption of phosphorus was lower than the estimated phosphorus intake from her daily diet (600 mg/d) because almost all of her diet comprised natural food originating from plants, as well as being washed and boiled thoroughly to remove phosphorus in these ingredients. Aphosphaturia and undetectable FGF23 were also compatible with phosphorus deficiency. Vitamin D deficiency is the most common cause in patients with rickets/osteomalacia. Serum parathyroid hormone (PTH) is negatively correlated with serum 25(OH)D ; thus, vitamin D deficiency causes secondary hyperparathyroidism in these patients, resulting in increased bone resorption and loss of bone density. Our patient was also diagnosed with vitamin D deficiency based on the low concentration of serum 25(OH)D; this caused a tendency for secondary hyperparathyroidism (whole PTH was at the upper limit of the normal range) and increased bone resorption. Despite alfacalcidol treatment before phosphorus supplementation, the patient exhibited persistent hypophosphatemic osteomalacia. The histomorphometry of the bone specimen showed not only a marked increase in osteoid, but also defective mineralization manifesting as irregular, attenuated, and less intense tetracycline labeling. Notably, phosphorus supplementation markedly resolved her symptoms and pathological fractures, consistent with fracture healing in phosphorus restriction models. Bone metabolic markers also improved in parallel with her clinical recovery. This clinical course confirmed that phosphorus deficiency was essential for the impaired bone mineralization in this patient. Additionally, BMD of the lumbar spine was increased, most likely from calcification of unmineralized bone tissue by phosphorus supplementation. We have described a unique case of hypophosphatemic osteomalacia that was induced by a strict phosphorus-restricted diet and subsequent phosphorus deficiency in a patient with CKD. Histomorphometry revealed not only marked increased in osteoid, but also defective mineralization; treatment with phosphorus improved symptoms, fractures, and bone metabolic markers.